It’s that time of year once again! As summer adventures come to a close, students begin shifting gears and buckling down for the year of learning ahead. For students in 22 lucky schools throughout Massachusetts, they’ll be sharing their classrooms with some tiny turtles who are looking to get a little head-start on their year too. For Blanding’s turtles in Massachusetts, a head-start in schools can have a huge impact on their future. Biologists from the Eastern Massachusetts National Wildlife Refuge Complex and their partners across the state have discovered that allowing the hatchling turtles to grow a bit bigger and stronger in captivity for their first nine months of life can greatly improve their chances of survival in the wild. The Blanding’s turtle is a semi-aquatic freshwater turtle that typically uses vernal pools, marshes, and slow-flowing wetlands for breeding and feeding. They can be identified by their highly-domed top shell, or carapace, and their unique bright yellow chin and throat that creates a turtley cheerful grin. Unlike some other freshwater turtle species, Blanding’s turtles cover a lot of ground, up to a mile, while searching for wetlands and suitable nesting habitat. A Blanding’s turtle crossing a road. Photo by Courtney Celley/USFWS. When Blanding’s turtle hatchlings emerge from their nests, only around 1 in 5 of the quarter-sized, defenseless (their shells are actually soft after hatching) turtles avoid becoming a snack-sized bite for lurking predators in their first year. While low survival of hatchlings is common in many turtle species, Blanding’s turtle populations are in particularly serious decline due to a number of factors. This decline is partly because the long-lived turtle doesn’t reach sexual maturity until 15-20 years of age, making it very important for turtles to reach adulthood and reproduce. This can be especially challenging for adult Blanding’s turtles who frequently cross roads and other hazardous landscapes. Currently, the species is under review to determine if federal protection under the Endangered Species Act is warranted. A portion of the hatchlings from each nest are randomly chosen for the head-start program and the remaining turtles enter their habitat as they naturally would. Raising the turtles in captivity during their first year before releasing them into the wild helps them grow to a larger size more quickly, decreasing their chances of being predated. During head-starting, the newly-hatched turtles are fed daily and kept in warm water, allowing them to grow three to four times faster than they would in the wild. Once they’ve grown for nine months, the turtles are released back into the wild. With this extra growing time, their first-year survival rate jumps to close to 80%, with an even higher chance of survival in subsequent years as they get even larger. Blanding’s turtles aren’t the only ones benefiting! Students play a huge role in the growth and development of the turtles, while also gaining hands-on experience with scientific techniques and wildlife management. Students also learn about the challenges facing the turtles and their own environmental impacts. 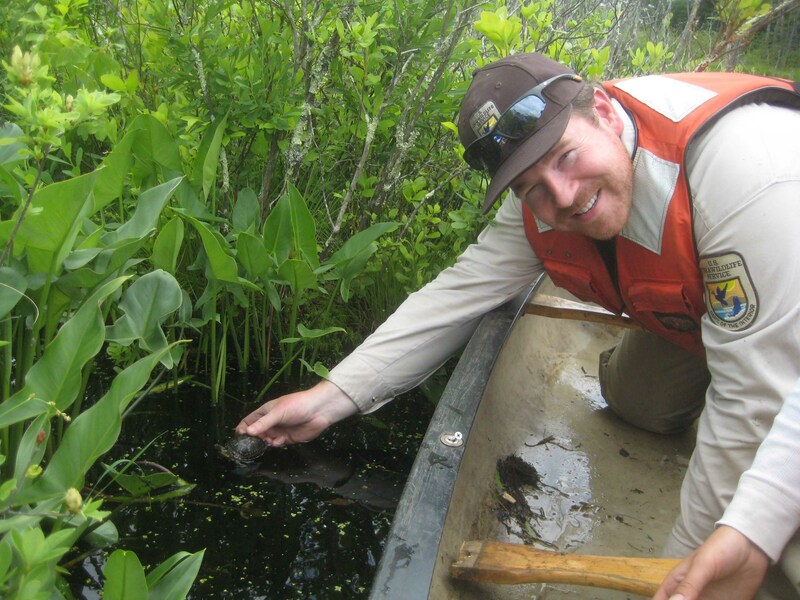 Brian Bastarache, Natural Resources Program Coordinator at Bristol County Agricultural High School in Dighton, MA, has been one of the leading advocates for the use of head-starting to combat declining turtle populations. Brian and his students have been raising the majority of the program’s Blanding’s turtle head-starts every year since 2009 as well as working to head-start the federally endangered northern red-bellied cooters. He thinks the experience students gain from working with the turtles is more beneficial than any worksheet. For Bristol County Agricultural High School Alumnus Kourtnie Bouley, the message of wildlife conservation inspired her to pursue a two-year internship with the Service, where she helped protect the nests, gather the hatchlings from the field, and process the turtle hatchlings at the refuge after helping to raise them as a student. Currently, the largest population of Blanding’s turtles in the Northeast resides within Eastern Massachusetts National Wildlife Refuge Complex. The population is so healthy and stable that it allows a portion of the head-started turtles to be introduced into new areas within their historic range. With numerous wetlands and upland nesting habitat, Assabet River National Wildlife Refuge in Massachusetts (also within the Eastern Massachusetts NWR Complex) provides an ideal location for reintroduction. Since the program began in 2006, over 900 Blanding’s turtle head-starts have been released to the refuge. With another good season of hatching success this summer, the one-thousandth Blanding’s turtle head-start could be released next spring. The long-term success of this program will not be known for several years, but if successful, it could result in the third or fourth largest population of Blanding’s turtles in the northeastern United States. And to the dedicated biologists, partners, teachers, and students involved with the head-starting project, it has already provided unforgettable experiences and long-lasting memories. This entry was posted in Blog entries, National wildlife refuges, Youth and tagged at-risk species, back to school, Blanding's turtle, bristol aggie, eastern massachusetts national wildlife refuge, head-start, Massachuesetts on September 4, 2018 by leahahawthorn. Reading, writing, arithmetic and…turtles! Jared Green, our Biological Science Technician at Eastern Massachusetts National Wildlife Refuge Complex, reports that the refuge and students from Peter W. Reilly Elementary School in Lowell, Massachusetts, concluded a successful partnership earlier this summer when they released into the wild a pair of Blanding’s turtles raised by the students in their classroom. And now the school is awaiting a new pair of Blanding’s turtle hatchlings to raise in the classroom this school year! The Blanding’s turtle is a medium-sized, semi-aquatic freshwater turtle and a threatened species in Massachusetts. The turtles travel seasonally over land and require a variety of wetland habitats. They are threatened by wetland loss and habitat fragmentation due to development. Two of the largest populations of Blanding’s turtles in the northeast exist at refuges within the Eastern Massachusetts National Wildlife Refuge Complex, comprised of eight ecologically diverse refuges situated along a migratory corridor for birds and other wildlife. You can access a brochure for the refuge complex here. Biologists are attempting to establish a population of Blanding’s turtles within the complex, which offers protection from habitat loss and road mortality, two of the main threats faced by the species. Raising the turtles in captivity during their first year (“head-starting”) before releasing them into the wild increases their chances of survival by helping them grow to a larger size more quickly, decreasing their chances of predation. During head-starting, the newly-hatched turtles are fed and kept in warm water, allowing them to grow three to four times faster than they would in the wild. That’s where the second grade students from Reilly Elementary School came in. Jared reached out to a teacher at Reilly Elementary School, one of the schools involved in the urban education program run by the refuge complex. Teacher Alison Bilodeau and her class offered to head-start a pair of Blanding’s turtle hatchlings during the 2014-15 school year. Jared provided an educational presentation for the class at the beginning of the year to help the second graders understand why they were raising the turtles, and the class was off and running. Jared reports that the students had a lot of fun raising the turtles in their classroom. Then in June, the students traveled to Assabet River National Wildlife Refuge to release their turtles. The students were very enthusiastic about being on the refuge, Jared says, and had remembered quite a bit from the presentation he gave at the start of the school year. Since the students at Reilly Elementary School did such a great job raising their turtle hatchlings, Jared will be bringing them another pair in September to head-start during the 2015-16 school year. He also plans to reach out to other schools involved in the urban education program to see if they’d like to raise Blanding’s turtle hatchlings in their classrooms. Jared reports that the Blanding’s turtle head-start project reached a milestone during another release this past spring, when refuge staff released their 500th Blanding’s head-start raised turtle to the refuge since the project began in 2006. 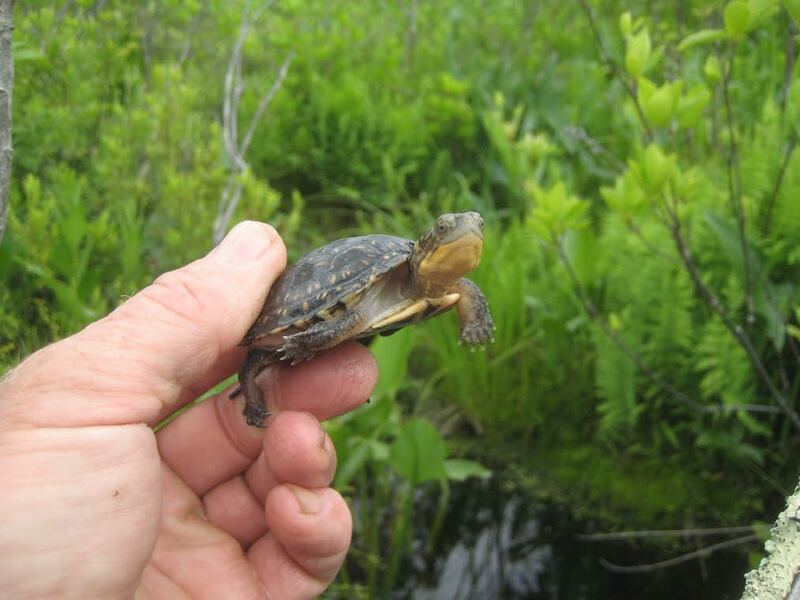 Including the non-head-started hatchlings that have been released at the site, over 1,000 Blanding’s turtles have now been released to the Assabet River refuge. For the students from Reilly Elementary School, many of whom live in urban areas, the head-start program presents an exciting opportunity to connect with nature in new and rewarding ways. The program is important not just for the turtles, but for the youth who guide them on their journey from the classroom to the great outdoors. If you would like more information on the Blanding’s turtle head-start project, contact Jared_Green at jared_green@fws.gov, or Dr. Stephanie Koch at stephanie_koch@fws.gov. 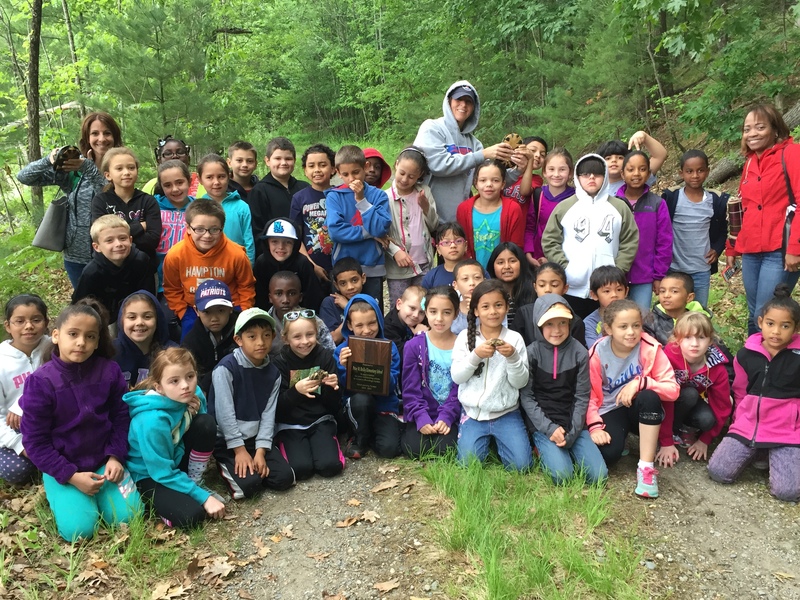 This entry was posted in Blog entries, National wildlife refuges, Partnerships, Youth and tagged assabet river national wildlife refuge, Blanding's turtle, eastern massachusetts national wildlife refuge, hatchlings, head-start, Jared Green, Lowell, MA, Reilly Elementary School, Stephanie Koch, urban, urban initiative, youth on September 3, 2015 by kathrynwhitacre.